Having a beautiful wreath in your home doesn’t have to cost a lot of money. In fact, you can create one with things that you already have in your home. 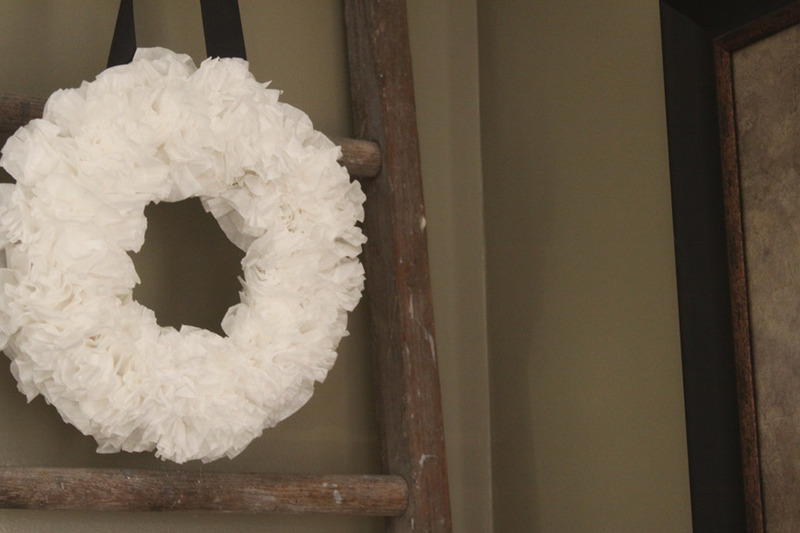 A few coffee filters, some hot glue, and a dollar store wreath form can create a beautiful and simple wreath. Here is a quick and easy DIY project to spruce up your home for spring. 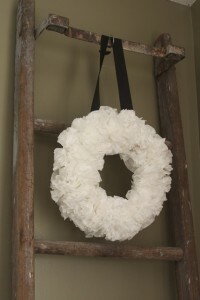 Coffee filter wreaths are certainly not a new idea, but I simply love the concept of them. I adore the idea of thinking outside of the box, and creating things from unexpected items that you can find around the home. I tried my hand at creating a coffee filter wreath for the first time well over a year ago, and was shocked at how much I loved the finished product. 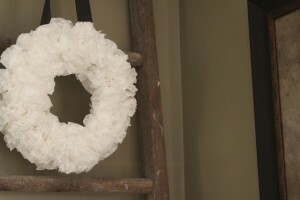 The simple color scheme and textures create a wreath that looks sophisticated but is made with everyday items. The first step in creating the wreath is wrapping and gluing a few coffee filters around the wreath form to cover it completely. This is basically to make sure that none of the wood color shows through when you are done, and gives a nice finished look to the back of the wreath. I wanted my wreath to be able to lay flat against a mirror in our house so I left the back with just the filters wrapped around the wreath. Once I had my wreath base covered I was ready to add the ruffled filters for a 3D effect. I began by taking one filter at a time and making it into a little ruffle. I pinched the center (on the bottom) of the filter and then pushed the surrounding parts of the filter up and together. I then twisted the bottom a couple of times and cut off a piece about 1 1/2 inches from the bottom. I would hold the twist in place so the ruffled filter kept its shape. I then applied hot glue to the twisted bottom and placed it onto my wreath. I held it in place until the glue was hardened enough to secure it, and repeated the process. I stared in the center and worked my way to the inside of the wreath and hen to the outside of the wreath. The trickiest part is making sure that the filters are evenly place around the inside and outside of the wreath. Be sure not to try and make it too terribly uniformed through the center, and feel free to manipulate the filters a little after they are securely glued to the wreath for a natural looking wreath. After the filters were all attached I glued a pretty black ribbon to the back so I had something to hang it with, and I was all done. Less than $4.00 worth of materials and one nap time is all it took to create this adorable little ruffled wreath! 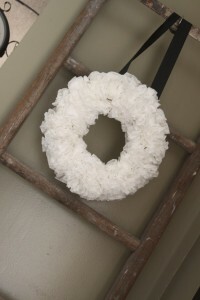 I love to break out this wreath when spring time hits and hang it on an old ladder or mirror in our living room. I have seen these made with brown filters, and dyed filters and they are always beautiful. 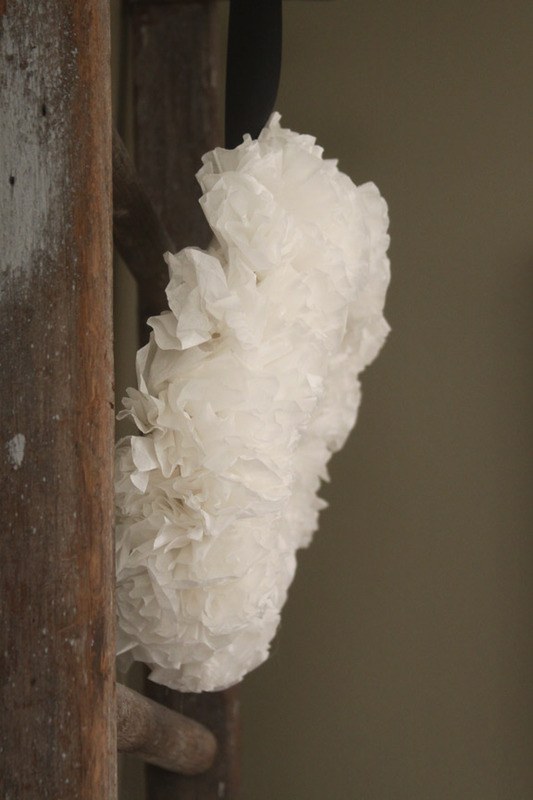 A coffee filter wreath is simple and cheap way to change things up in your home for spring. You should – so easy! Are you thinking for inside or outside? I was thinking for on the outside of our front door, but it would still be inside the storm door so I think it would hold up ok. This is cute and a great idea!! !